Tell us how 9 mm was born, and how did you start working with Yulian? Before founding the group I went to live in Italy because I got married and I went there to become a resident. And so analyzing my project based on my group, I began to do fusion, a sort of timbaton. But within a few months I realized that it wasn’t my musical path to follow, so little by little I worked on finding my style as a soloist and as a band leader. Before Yulian I had several arrangers who still work with me but due to their work commitments I found myself obliged to search within the orchestra for someone who could follow the path they had started and Yulian was the best for that responsibility having the most arrangements in the material from this first album. I imagine that it is difficult to try to start and find the musicians, a rehearsal venue, instruments and everything. Were there moments when you doubted or were you always sure that you were on the right path? I had my doubts. I confess that at some point I thought of abandoning the idea, not because I wasn’t sure of what I can give as a singer, but because of how difficult it is in these times is to move forward with a new band with so many musical trends in the world that put the life of this genre at risk. But names like Alexander Abreu and like Maykel Blanco gave me encouragement to continue and defend my music and that of all Cubans. Were there any people who supported you in the process? I had a lot of support but at the same time I had and I have many opponents who were not and do not agree with my work, not because it is not well done, but maybe the very fact that I’m on the right road bothers them and they put obstacles in my path as I continue. Of course I have to ask you, who are your horns? Ha ha ha. In the recording you worked with Raydel Garcia and with Eduardo Sandoval but who are now in the performances? The phrase "now you want to know who my horns are and I'm not going to say" is that – ha ha ha –sorry that I’m laughing because it's funny. At the beginning I started recording with the horns from Salsa Mayor, and to keep it hidden, because they could have problems for helping me, I thought of that phrase and liked it a lot and it created a lot of curiosity. For quite a while now the leader of my horn section is Raydel Garcia, one of the former Mayores like me, and Eduardo Sandoval is always invited to my recordings and is considered one of the best trombonists in Cuba. 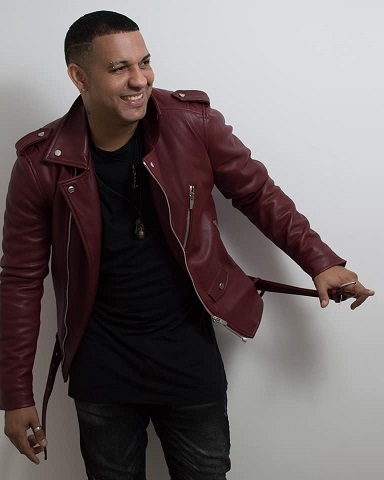 Maykel (Cuchilla) recorded the piano, Bombón the drums in the song "El Artista" and in the coros Alexis David another ex-Mayor and Jannier a corista from Havana D'Primera. You yourself are responsible for all compositions. Where does inspiration come from? Do you start with a coro or with the verse or how? My inspiration almost always starts with a coro and from there I get the lyrics. I think Yulian has understood well what I want with my songs and how I hear them in my head. The audience and the dancers have the last word. The arrangements are great and interesting. Most are from Yulian but you also have Cuchilla and three from Alfonso Álvarez. How is it to work with different arrangers, and how much do you leave the arrangement in their hands and how much do you say "I want something like this"? Working with different arrangers is complicated, but I have managed to keep them together following the same path according to the style of the group and looking for a hallmark that identifies us. On July 20, you announced on Facebook that Nachito Herrera Jr. is now working with the orchestra as a music co-director with Yulian. Nachito is an excellent musician and arranger and with a really fresh touch when it comes to arranging. He has a lot of “feel of the street” as an arranger. You did two songs with guest singers. Tell us how the collaboration with “El Niño” came about in "Víctima de la Distancia". The song with “El Niño” Emilio Frías was one that I had saved and I didn’t decide with whom to do it until it occurred to me to do it with him. He is an excellent singer and great friend and it has worked very well. And the lyrics of the song “Somos Cuba” are about the new timba generation and that instead of competition there is a union between the young artists. Tell us what inspired the song and work with Dayan, El Noro, Alexis David and Kasanova. "Somos Cuba" - that song came to me because I think this genre is lacking in more unity, and this new generation, we have very good communication and we are all fighting without competition, respecting the parents of Cuban music, looking for a place and respect within the national culture. All of the participants are excellent singers whom I respect very much, and in that song we make clear what we want and where we’re going. Where and when does the orchestra perform? Is there a fixed weekly schedule? Our usual show was in Casa de la Música Galiano but because it is under renovation now, we have no fixed place for our performances. But we alternate in different places during the week like Café Cantante and Casa de la Música Miramar. Since you’ve finished with the first record, what's next? What is the next challenge or task for the orchestra? Videos, tours? Other plans you’re making? We have finished our first album and soon we will be having the official release. We have our first video clip ready. And the challenges of the orchestra - reaching Europe - I am very interested in that market, but I want to arrive when I believe that the group is very strong. As to the question of promotion and demand in the concert halls, for now we’ll continue working for the preference and respect that the dancers deserve.